Well, he did it again! 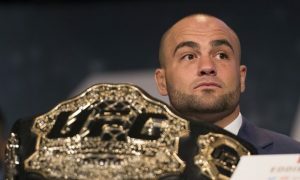 So many UFC fighters wrote him off as having little to no chance of beating Eddie Alvarez, and once again he proved them wrong, not only did he beat Alvarez, he did it in spectacular fashion, making it look as easy as a stroll through the park. Now I can see why so many fighters picked Alvarez, after all he has been around for awhile, been the Champion in different organizations, has years of experience, had a very good record of 28 wins and 4 losses coming into this fight, and has defeated some highly respected fighters like Pettis and RDA, who were both Champions themselves. Overall Alvarez was/is considered to be one of the best well-rounded fighters in MMA, with a ton of heart, and experience. But, having said that, and even though I agree with that assessment, there’s an element he lacks, and that element is greatness. Alvarez is very good at everything but great at nothing, he’s like the jack-of-all-trades of MMA. He is as everyone calls him, a grinder. So it came to me as no surprise that Conor beat him. As Conor himself said, to beat him you need attributes. You need to be taller, or bigger, or have longer reach, or excel in something that you can utilize against him. Being the same size, or smaller, or being good but not great, isn’t going to cut mustard. Maybe you’ll get lucky, maybe, but not likely. 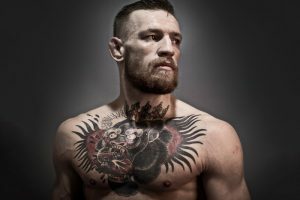 Conor is a great striker, there’s no way around that, his precision is amazing, the timing is superb, the execution is almost flawless, he makes it look so effortless that he seems to just touch his opponents and they fall down. It doesn’t even look like there’s power behind those strikes, but they make men topple. His take down defense compliments his striking, it’s not great but it’s good enough to thwart all but the best wrestlers. Only Mendez, who is considered a top premier wrestler, had any real success at taking him down. No doubt GSP would take him down at will, but then he took everyone down at will, and that fight would never happen anyways. And speaking of GSP he was one of the very very few fighters who actually picked Conor to defeat Alvarez. But that doesn’t surprise me, GSP has always been very good at sizing up opponents. So now Conor has both the 145 and the 155 titles now, the 1st UFC fighter to hold two weight class belts at the same time. He has yet to defend either. Which brings me to the next point. Conor fan boys calling him the GOAT ( Greatest Of All Time ) are premature. He’s not even close to being the GOAT. To be the GOAT you need to not only win the belt, you need to defend it, take on all comers, clean out the division, and retire a Champion. So far, only GSP has been able to do that. Silva lost his GOAT status when he didn’t know when to retire and lost the belt to Weidman, and successive losses since. Now it’s possible Demetrious Johnson might replace GSP as the GOAT, he only needs to revenge that loss to Cruz ( no one cares about that loss to Pickett ) and then retire. Getting back to Conor, so what’s next? If his intention is going after that 3rd belt then there’s only 1 scenario I see that’s plausible. To keep the 145 belt intact he needs to defend it. I don’t see anyone at 145 that could be a problem, not even Pettis at that weight. And he should defend it before May 2017, before the time his child will be born. Then he can , as he stated, take some time off. Late 2017, or early 2018, he should defend his belt against the winner of Khabib and Ferguson. Neither, in my opinion is deserving of a title shot until they fight each other. Khabib just beat number 6th rank Johnson, and Ferguson just beat RDA, the former champ. They need to fight each other to establish who is the number 1 contender. Personally I think Khabib would be the easier fight for Conor. He can get tagged, and Conor’s reach and take down defense might be enough to hold him at bay till he can hurt him. Ferguson, on the other hand, could be a problem for Conor. He’s about 2 inches taller and has about a 2 inch reach advantage. Now, if he was to beat the winner of Khabib and Ferguson then the next step would be to step up to 170 and attempt to take that 3rd belt in around late 2018. Is it possible he could beat Tyron Woodley? I think it is, they have identical height and reach. They’re both 5 foot 9 inches, and both have a 74 inch reach. The only thing would be that Conor would need to acclimate himself to the weight change better than he did with Nate Diaz, which is why I stressed that he should spend most of 2018 preparing for it. 2 belts ensure he’s in the UFC HOF ( Hall Of Fame ), 3 belts would solidify him in the history of every combat sport known to man as one of the best there ever was, but if he doesn’t defend those belts, if he doesn’t clean out those divisions, if he doesn’t retire a Champion, he’s not the GOAT. Added by admin on November 18, 2016.